Last week I discovered that somebody has kindly constructed my PhD Tree. I later discovered that similar things have been constructed for quite a few other scientists of my acquaintance. Perhaps even yours? Incidentally, you might like to see Dirac’s hand-written notes for his PhD Thesis, which you can find here. It dates from 1926. As far as I am aware this is the first PhD thesis ever written on the subject of Quantum Mechanics. It’s also worth mentioning the tremendous contribution to British science made by R.H. Fowler. Fifteen Fellows of the Royal Society and three Nobel Laureates (Chandrasekhar, Dirac, and Mott) were supervised by Fowler in Cambridge between 1922 and 1939. This entry was posted on June 23, 2015 at 1:17 pm and is filed under Biographical, The Universe and Stuff with tags Paul Dirac, PhD, Quantum Mechanics. You can follow any responses to this entry through the RSS 2.0 feed. You can leave a response, or trackback from your own site. What is Dirac’s connection to AV Hill in the above scheme? I’m not aware of one, so I’m curious. I had to google Hill to find who he was and the result makes me question that connection. In fact I can find only one webpage which mentions them both and that is Fowler’s Wikipedia entry, which does nothing to further Hill’s “fatherhood” of Dirac (although both were brought up in Bristol). Dirac didn’t have many research students, did he? “Dirac didn’t have many research students, did he?”. No. Note that no-one was ever awarded a doctorate for working with Einstein. Different people have different strengths. Dirac’s son Sciama made up for Dirac’s few children, though, both in terms of numbers and in terms of quality. I’m not really familiar with Hill. I was always told that Dirac’s supervisor was Fowler. I don’t recall any mention of him in The Strangest Man, either. Is it an error that has propagated from somewhere else? Hill was Fowler’s advisor. Someone probably made a typo and other people copied it. Milne and Hartree also worked for Fowler. There is some stuff on this in Beating the Odds, which is a biography of Milne by one of his daughters. During war, many scientists from different fields worked together, and some degrees might have been awarded based on research done then, perhaps classified research. This is probably how Hill came to be Fowler’s advisor. Milne and Hartree also worked for Fowler —> Milne and Hartree also worked for Hill. The link to Beating the Odds above was broken, so I hoped I’ve fixed it now. I didn’t realise that Fowler was wounded at Gallipoli while he was serving in the Royal Marine Artillery along with A.V. Hill. On Fowler’s wikipedia page it lists Hill as Fowler’s academic advisor, but it’s not obvious that this was anything more than an informal arrangement. Your children need to be added! some of them are known. They are there on the other tabs on the website? They are listed at your page. Check out the Mathematics Genealogy Project for many similar (but often incomplete) trees. They have a broad definition of “mathematician”, so many physicists turn up there. 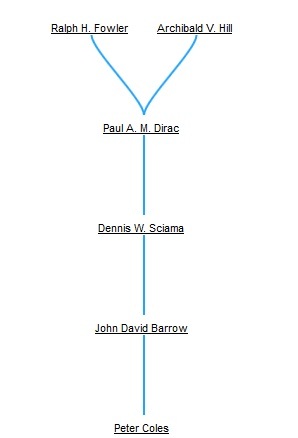 In particular, Dirac’s tree doesn’t mention Hill. Note that many of the trees are incomplete, though. As a physiologist I know quite a lot about Hill (1886-1977), though nothing about Dirac – I guess opposite to most readers here! Anyway, that was the b/g to my comment that I couldn’t see a Hill-Dirac connection. Hill started out as a mathematician – ‘3rd wranger’ in his Cambridge Maths graduating class, which means 3rd in the final rankings – but was by temperament more of a engineer, since his interest was in applied maths. Hill’s key contribution in physiology (and biology more generally) was to show how far you could get applying mathematical and physical ideas and analysis to biological systems, and you could make a good case for him as the founder of biophysics. You can read more about Hill here. I think I’ve now solved the mystery of the link, since Ralph Fowler seems to have been friends with Hill. Fowler (b 1889) was three years younger than Hill, but they both studied maths at the same Cambridge College, Trinity, so they would undoubtedly have met there. According to Wikipedia they later worked together on ballistics research during WW1 (see Fowler’s Wikipedia entry). So there is a clear link between Hill and Fowler, though to my mind not one we would strictly recognise as scientific ‘ancestry’. Anyway, I might have put a dotted line between Hill and Fowler, but I can see no link between Hill and the much younger Dirac (b. 1902)… though I dare say they would have met via having Fowler as a connection. During wartime, there were battlefield promotions, perhaps the equivalent in civilian life as well, and there were older people who picked their studies back up after some work on the war effort (recall the wonderful stories about Feynman trying to pick up girls at a student dance, and hence not wanting to say that he was a professor; when he was coy about his status, the girls assumed that he was an older student pickup up after the war; when they learned he was a professor he was slapped). Perhaps some similar configuration led to Hill being Fowler’s doctoral advisor, at least in some form. Indeed, see the comment above about the wartime work and Hill’s and Fowler’s connection. Of course, in those days the PhD as such didn’t really exist in the UK, so an ‘academic advisor’ in the modern sense of it wasn’t necessary. If people did acquire a formal “doctorate”, it was typically done in mid-career by submitting a portfolio of published work for a D.Sc. Some superb information has been posted in the last few hours by contributors to this thread; isn’t the internet wonderful? I was thinking that too. I’d not previously come across Fowler’s name in my various readings (and even writings) on AV Hill… And now, prompted by the this thread, I’ve found that description of Hill & co’s WW1 work in EA Milne’s obit for Fowler. Never seen that described anywhere else. If you are interested in these times, check out the book mentioned above. As I note in my review, it is primarily not about Milne’s science, but about his life and times. Of course, there is some information about his scientific work, but this is mostly about his ballistics work, and mostly that in the first world war. As I note in my review, I recommend the book and it was fun to read. Thanks, Phillip. I will definitely track it down, as the wartime work of people like AV Hill tends to be under-documented compared to their academic scientific history. In fact the PhD wasn’t introduced to the UK until 1917, so the first awards would not have been until a few years after that. Even after that some people never got round to acquiring one..! Sir Andrew Huxley is a famous example. There are several, even among relatively famous people: Freeman Dyson, Thomas Gold. I’m not sure about Bondi; perhaps he formally had a doctorate, but it might have been, in some sense, just a formality. Interesting. Hermann Bondi is the subject of a famous story about risks and the perception of risk, which I recounted in a post on my old blog. Not sure if there’s a definitive source for the anecdote. That’s nice because he’s Dirac’s academic grandson! I expect you to update your mugshot to one with a similar pose. Like father, like son?